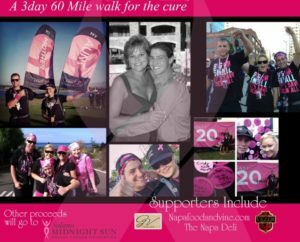 Kyle Barraza, The Napa Deli, GV Cellars, and Napa Food and Vine blog, and Vezer Family Vineyards are teaming up on October 1 to kick off Breast Cancer Awareness month with a fundraiser at GV Cellars. Kyle has chosen Solano Midnight Sun as a beneficiary of his fundraising efforts, at this event. We will be there to support his efforts on our behalf! Tickets are $15, in advance or at GV Cellars when you get there. The event is from 4pm to 7pm. We hope to see you there! When I was 12 years old, my aunt, Norma, was diagnosed with stage three breast cancer. That year I started my support and fundraising for Susan G. Komen. My aunt fought for 14 years until cancer took her from us. During these 14 years she was dedicated to the organization and we walked side by side in many cancer walks in Northern Nevada and California. First we started with the 5K walks and in 2012 we got involved in our first 3 Day 60 mile walk. While fighting cancer she continued to walk! After her death, my cousins and I have continued this tradition in her memory. We walk in hope that you or somebody you know does not have to go through the pain she did. Since 1990, because of foundations like Susan G. Komen, mortality rates have decreased by 37%. This year our goal is to raise $10,000. $5,000 for the Komen 3 day and $5,000 to stay here in Solano County for The Solano Midnight Sun Foundation! Please help us find a cure and donate! Kyle will be completing a 60 mile, 3 day walk in San Diego, California on November 18-20. We hope you can join us in support.